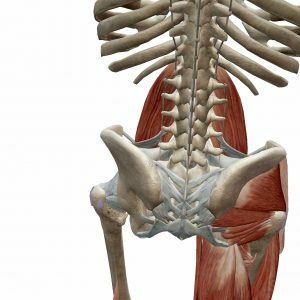 Let’s start off by talking about where the Psoas muscle is and what it does. 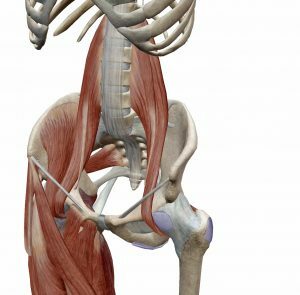 The Psoas muscle group is one of your major hip flexors. Psoas Major attaches to each of the 5 vertebrae in your lower back then travels down and attaches itself to your femur bone (thigh bone) just below the hip joint. Along the way, Psoas blends together with another muscle called Iliacus and forms the muscle group known as Iliopsoas. The main role of the iliopsoas is to move your hip into flexion – bending your hip up. If you are currently sitting down, you can activate your iliopsoas by lifting the back of your knee of your seat. Psoas syndrome is a common cause of low back and hip pain, most daily postures in general and in sports are forward leaning stressing the psoas muscle. It more commonly affects dancers, and athletes who are strongly and repetitively flexing the hip. Chronic psoas shortening or weakness can be cause by exercise programmes continually and repetitively using hip flexion. Sedentary life style and sleeping in the foetal position can also result in dysfunction of the psoas muscle. Psoas compensates for the difference in strength of the abdominal muscles and posterior spinal muscles, so if imbalance is found here psoas dysfunction may occur as a result in an attempt to stabilise the lumbar spine. When Psoas becomes overworked or too weak the muscle spasm that can result can cause somatic dysfunction or put unnatural stresses and strains on the lumbar spine causing disc herniation and sciatic nerve irritation. This can be emphasised by the surrounding muscles that compensate for the spasm. Symptoms will often present as diffuse aching lower back. The pain spreads or presents through the lower thoracic, gluteal and lateral hip regions. Pain will be found when rising from a seated position and worsened by extending the leg, continual standing and twisting from the waist without moving the lower limb. Walking and laying down are not effected unless a sever case is present and the pain will be relieved by hip flexion e.g. sitting down. Osteopathic therapy incorporates stretching and uses trigger points within the muscle to decrease tension and or reduce spasm to decrease pressure in the lumbar spine and discs. Strengthening the muscle and continued stretching will prevent future injury. The first simple stretch we can do is the hip flexor stretch as seen below. Stretching should be held 20-30 seconds and repeated up to ten times a day. Stretching may cause discomfort but should not be painful.. The key to targeting the hip flexors is to pull your pelvis back into a posterior tilt and squeeze the glute throughout all movement. This helps you build active hip extension while improving the hip flexor mobility. If you find that you can’t squeeze the glute, you are likely too deep into the stretch and need to back out. – Start in a half-kneeling position. – Place one-arm on the inside of the front leg. – Raise the other arm overhead. – Side-bend towards the opposite leg. For more information and further questions on hip flexors and psoas syndrome, please call the clinic (03) 9329 9889 or book online and make an appointment with one of our osteopaths today.